Why does a child “need” anything? Who determines what a child “needs”? How many times had I delivered care to a child based on what I thought the child “needed” without ever knowing whether the child and family thought they “needed” the same thing? This singular moment began a long, transformative journey from Pediatric Intensivist to a Pediatric Palliative Care physician. I’ve discovered an incredibly vibrant community of like-minded individuals committed to helping children and their families navigate their way through unthinkable circumstances. As Pediatric Palliative Care is a relatively new specialty, people bring skills and experiences from many different fields of expertise to the table – general pediatricians, social workers, pediatric oncologists, pediatric nurse practitioners, NICU physicians, pharmacists, PICU physicians, chaplains and on and on… To me, it is the collective collaboration that makes our work so interesting, fascinating and satisfying. Kevin Madden, MD is a Palliative Care physician at M.D. Anderson Cancer Center in Houston, TX where he specializes in Pediatric Palliative Care. In his former life he was a Pediatric Critical Care physician at Children's Hospital Los Angeles. He enjoys riding bikes, skiing, traveling and playing all sorts of sports with his family. A strong, active man in his sixties, he had been struggling and fighting for months—in and out of the hospital experiencing chemotherapy, radiation, and a long-term-care stay. He was suffering from cancer, pneumonia, and multi-system failure. He was my father-in-law and he would live for hours, or a few days. 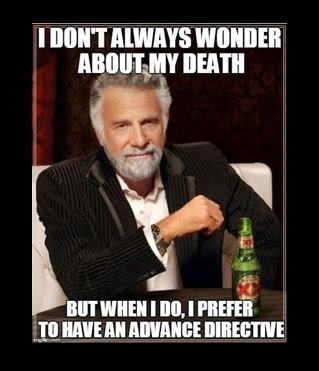 We knew his end-of-life wishes from the Advanced Directive and Living Will he had signed. So we were shocked when his primary care physician said, “If you three sisters agree, I’ll do everything I can.” It seemed that she was ignoring my father-in-law’s decisions and dropping all of the guilt and indecision back on the patient’s daughters. Confused and bewildered they agreed to a family meeting. A different physician attended. “There is nothing more to do,” he explained gently. “No other treatment will extend or improve his quality of life.” His suggestion: turn off the machines and use comfort measures. My father-in-law spent the next hour surrounded by family. He never regained consciousness. With his hands being held, in a comfortable, quiet, peaceful, loving environment, he died. I have nothing but admiration and affection for these doctors. I know each was suggesting what he or she thought was the best treatment option. But why was it so hard for the primary care physician to give the news to our family? Why did the news from the second physician seem to be such a shock for us? End-of-life discussions are so difficult, but also so necessary. PBS’s recent documentary, “Being Mortal,” opens the window into the often excruciating choices that doctors need to make. Tell a 34-year-old mother with stage four lung cancer to forego chemotherapy so she can hold her newborn? In his best-selling book of the same name, Dr. Atul Gawande bravely admits that he would have talked differently with this patient and many others. But, he says, for doctors, conceding that a patient might be better off stopping curative treatment is declaring defeat. It’s no wonder. Doctors are trained to keep people alive. But Gawande is helping change the conversation about death and dying in America. It’s not just about mortality. It’s not just about living longer. It’s about understanding patients’ wishes. It’s about living better. Today is National Doctor’s Day. Established in 1991 by President George H. W. Bush, it’s a day to recognize the sacrifice of the men and women who carry on the quiet work of healing. It’s also a day to recognize the heavy emotional burden that doctors carry, and the struggle many of them face talking about mortality. It takes a strong dose of understanding and a great deal of courage to shift the conversation from treatment to other options, especially when physicians sense the patient isn’t ready. In fact, according to the Institute of Medicine’s recent Dying in America report, one out of four adults has given little or no thought to end-of-life wishes. Fewer have communicated their wishes in writing or through conversation. Doctors are picking up on our reluctance to admit that we’re not going to live forever. Ironically, other research shows that both consumers and physicians would like to talk sooner rather than later. In our comprehensive Hospice Care survey of consumers and physicians across America, Crossroads Hospice found that one out of three doctors and patients say they’d like to have the hospice conversation at the time of diagnosis or the start of treatment. Yet only one out of five physicians we surveyed actually starts the conversation then. Doctors are totally human. Doctors are optimistic. Doctors are relentless in their search for answers. Understandably, many doctors are reluctant to discuss hospice because they feel they are giving up on a patient. But hospice isn’t about giving up hope. It’s about creating hope-filled experiences for the patient at the end of life’s journey. Today is a day to thank Dr. Gawande and other physicians who are advocating for earlier end-of-life conversations between doctors and patients. It’s a day to thank doctors for their willingness to speak to patients with compassion and honesty about their options. And it’s a day for all of us to remember to share your hopes, your fears, and yes, your end-of-life wishes with those you love and love you back. Perry Farmer is the President and Co-Founder of Crossroads Hospice, the fifth-largest hospice company in the United States. This piece was simultaneously published here and the Philadelphia Inquirer. In a recent #hpm chat, we touched on the topic of “redesigning death”. The discussion moved to finding ways to insert hospice and palliative medicine into everyday life, moving away from medicalizing death to humanizing it, or re-humanizing it. Atul Gawande framed it very well in his recent speech at the AAHPM Assembly with one simple statement in regards to dietary restrictions: “Let ‘em have the damn cookie.” And again, at the Institute of Medicine conference on March 20th, Atul Gawande, touched upon emotions and desires that change for people as they grow older. Hopes and goals shift from a medical focus to desires related to being with certain people and enjoying simple experiences. The anticipation that well-being is possible even under difficulties of disability by putting the focus back on the person, no longer on the disease or treatment, and the life the person wants to live. 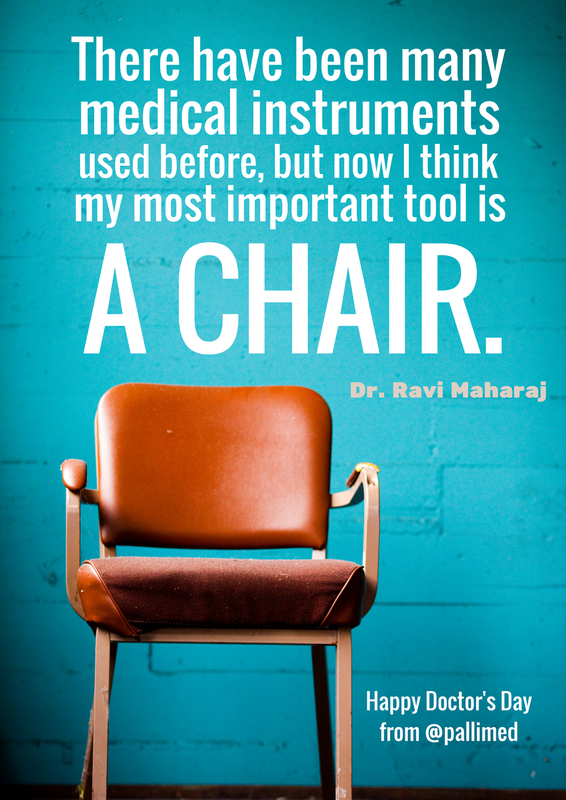 Watch Gawande's full keynote address from the IOM below. 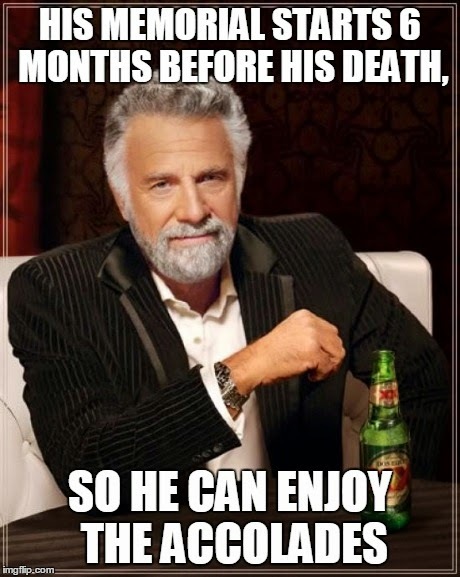 And at the close of the chat Joe Rotella (@jrotellaAAHPM) wondered what the Most Interesting Man in the World’s take on dying would be. So here are a few thoughts, just for fun! 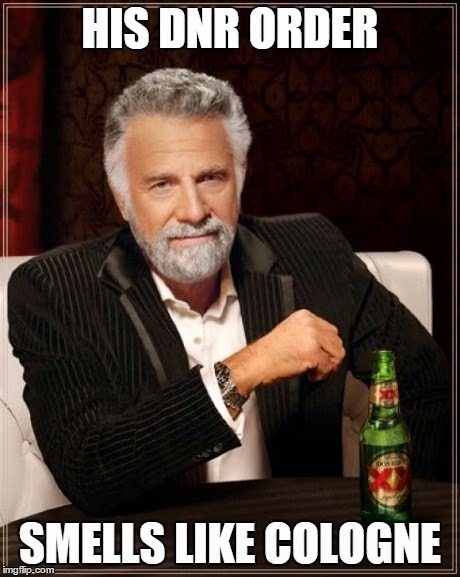 Feel free to tweet your highly entertaining “interesting man in the world thoughts on dying” using the hashtag #InterestingEoL and share it on your social media platform of choice. 1. 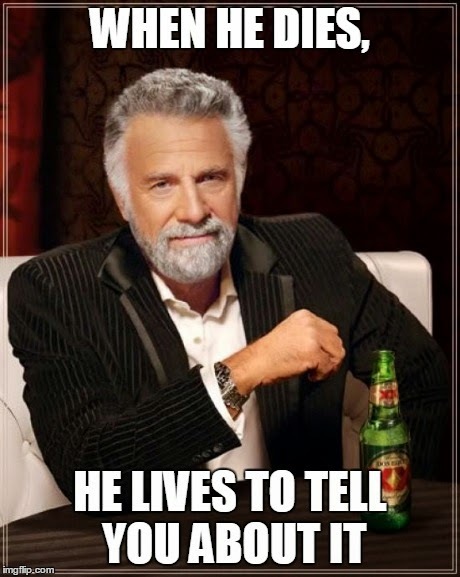 When he dies, he lives to tell you about it. 2. 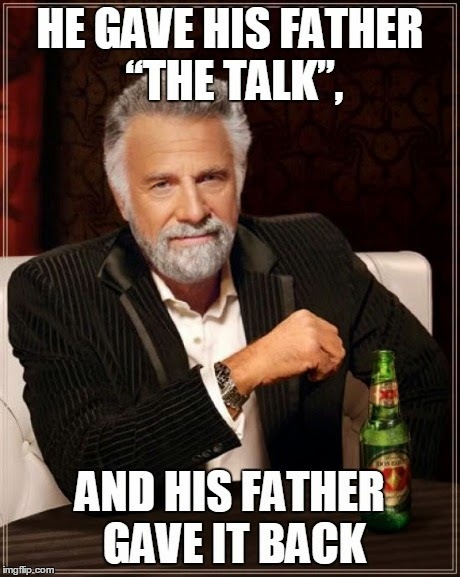 He gave his father “the talk”, and his father gave it back. 3. His memorial starts 6 months before his death, so he can enjoy the accolades. 4. 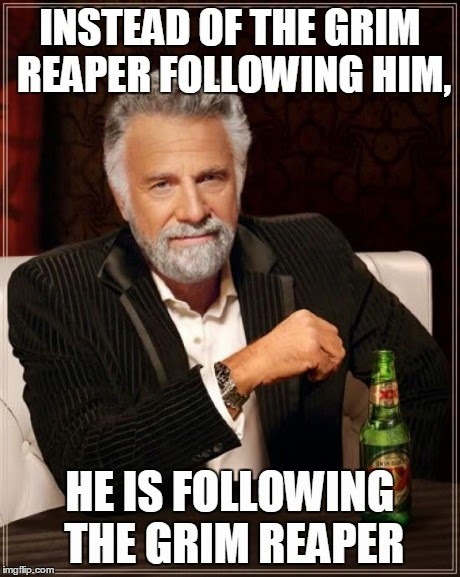 Instead of the grim reaper following him, he is following the grim reaper. 5. His tears can alleviate suffering, but he never cries. 6. 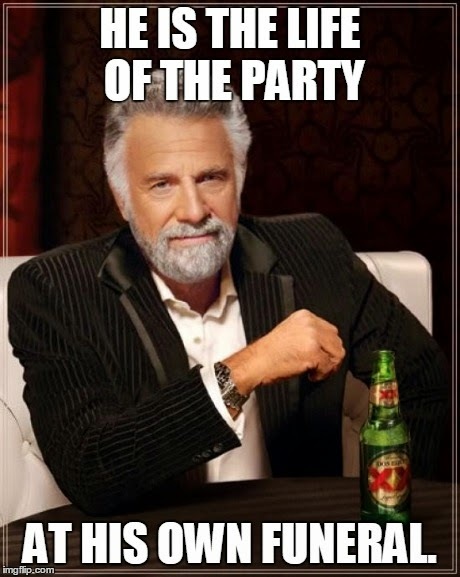 He is the life of the party at his own funeral. 7. He once enrolled with hospice just for fun. 8. 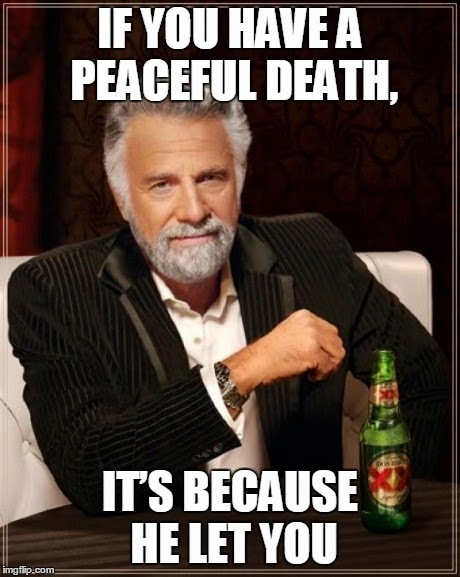 If you have a peaceful death, it’s because he let you. 9. 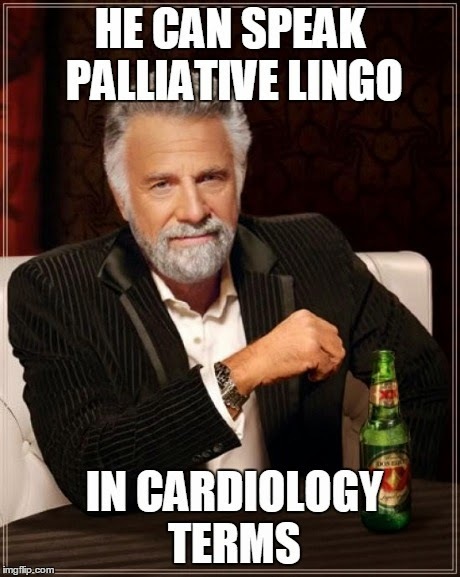 He can speak palliative lingo in cardiology terms. 10. His DNR order smells like cologne. Niamh van Meines is a Hospice and Palliative Care Consultant and Nurse Practitioner at Practitioner Solutions. She assists hospice and palliative care organizations with program development, quality improvement and clinical education. For fun, she likes to hang out with 2 energetic beagles, listen to world music, and explore beaches & national parks with her family. 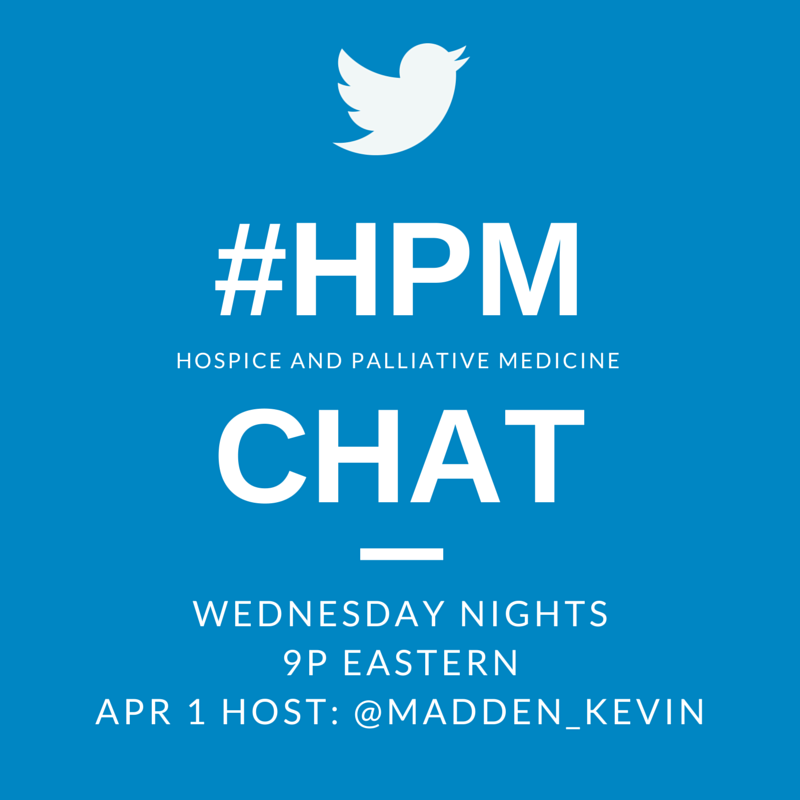 Join us Wednesday nights for #hpm chat at 9p ET on Twitter. 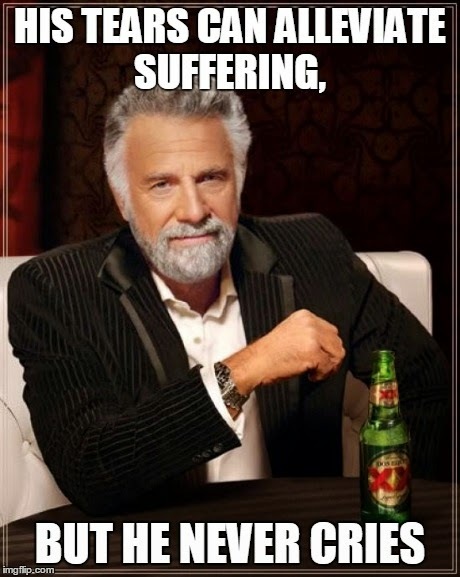 If you would like to make your quote into an image you can use a meme generator like imgflip.com. Certain things are just universal. All humans need nutrition. All humans need hydration. All humans need air. There really is no argument to these basic needs for existence. Once our physical needs are met, the priority becomes filling our emotional needs. At the heart of our emotional needs is the desire to feel safe and secure. As children, we are taught that a key way to feel safe and secure is through the approval of our parents, and as we age, we become conditioned to seek out approval of others as well. The degree of power to which we give others approval of us varies widely and is based on things such as personality, upbringing, and life experiences. One thing there is no need to debate, approval of others feels good and is validating. We know that approval is tied in to safety and security, so you can imagine during the end of life, if a person isn’t feeling safe and secure, they will seek out approval even more. The ways someone seeks approval can be subtle or direct. Some take medications they don’t want in an effort to get the approval of their doctor or family members. Others get out of bed when they don’t feel like it, or eat a few bites of a meal despite having no appetite. I see patients entertain guests when they’d rather be sleeping, still seeking the approval of others. Other times approval seeking comes with stories from the past as people use the narrative of their lives to gain validation. Amazingly, some even prolong their dying as a means of gaining the approval of family members who don’t want them to die. Since approval is a universal emotional need, a helpful thing family and friends can give at the end of life is the gift of approval. The easiest way to think about how to give approval is to give permission. Permission removes any guilt associated with seeking approval and fear of disappointing those we love. Give someone the permission to be tired, to not eat, to be worried, to be angry, to refuse treatment, to feel sad, or ultimately to die. It’s not just the patient that needs permission during end of life situations. Caregivers and family members need permission as well. They too are seeking approval in an insecure and unsafe reality. One of the greatest areas caregivers need permission is in letting go of the caregiving to step back into the role of spouse/child/friend. It is impossible to provide both total physical care as well as emotional care towards the end of life. Society unfortunately gives approval to the more tangible physical care, despite the more important value that comes with emotional care that only family and loved ones can provide. Often it takes a hospice team to grant that permission. Just like with patients, we can be responsible for granting approval to caregivers and loved ones. By giving them permission to be where they are, whether angry, sad, worried, not wanting to say goodbye or hoping it was all over. Permission is a simple way to give approval with untold benefits for those around us. Dr. Clarkson is a hospice physician for Southwind Hospice in Pratt, KS. This post was originally published in Dr. Clarkson's End Notes column for the Pratt Tribune. It is re-published here with the author's permission under a Creative Commons license. Doctors find it hard to talk about prognosis for a variety of reasons. Sometimes we do not like to talk about it because we are afraid that if we talk about it, it will happen –a self-fulfilling prophecy. I think this is often a reason that some doctors do not like to make patients DNR - they worry that if we make the patient DNR that we will not try as hard to correct problems and thus they be more likely to have a cardiac arrest (the data is controversial and this may be true). 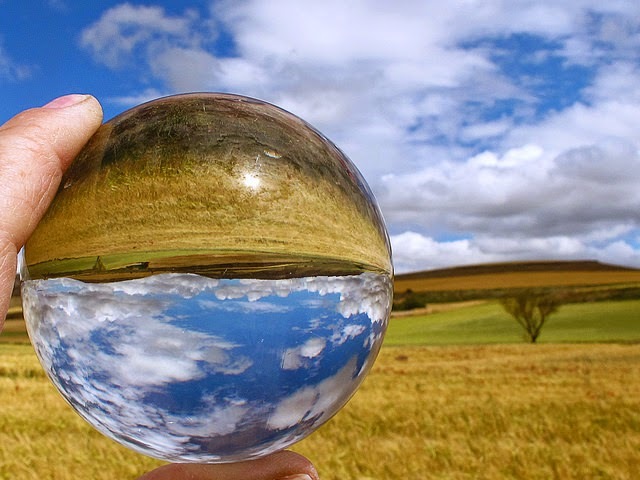 Other times, we do not like to talk about it because it means predicting the future, and when you predict the future you are often wrong (what I call “the weatherman phenomenon”). Patients or families may get mad when our predictions are incorrect which may lead to difficult conversations in which we feel bad. Doctors, not wanting to be wrong or feel inadequate, find it easier to be vague (“He is very sick and may not do well” is similar to the weatherman saying, “It is going to get brighter as the day goes along before darkness sets in”). 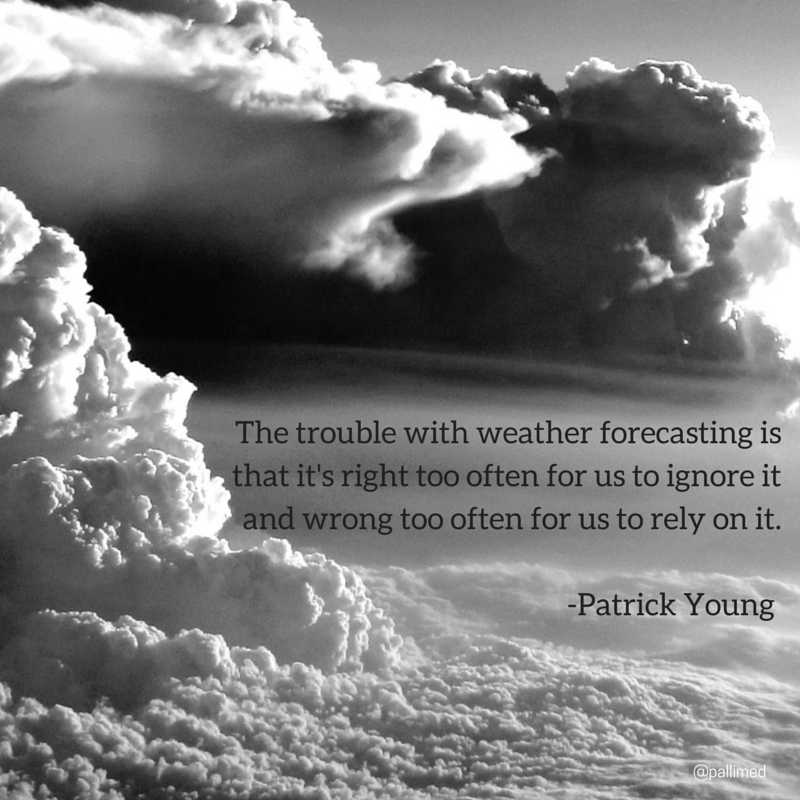 The problem is that prognostic information, like the weatherman's predictions, is vital to people's lives. It is hard to make decisions about medical interventions, about when families should come to visit their sick loved one, about when to have serious conversations without some idea of what the future might bring. For that reason, patients and families are often frustrated when doctors refuse to make any predictions about what might happen in the future. Families understand that the future is unpredictable, and the doctors are not all knowing and cannot know the future. Yet, they still want to have some ideas about what we are thinking because like weathermen, while we are not always right or wrong, we do have some expertise in prognostication. For that reason, I have assembled four general hints to improve your ability to help the family think about prognostic information. (These recommendations assume that the patient/family wants to know prognostic data – about 75% do according to studies.) The purpose of these rules of thumb is to help the family begin to think about what their loved one would say about these possible futures. 2) Offer outcomes as best, worst and most-likely. Toby Campbell at the University of Wisconsin has talked about the helpfulness of talking to patients and/or families about the best, the worst and the most likely outcomes. What I like about this formulation is that I do not have to be right. I can be hopeful about what may happen if everything goes well and yet it also allows me to be realistic about the most likely outcomes. It also allows space to be pessimistic about what the alternatives are. This formulation is helpful to families because it gives them a range of outcomes to get their head around. They can think about what it would mean if the “best” outcome is one which the patient would find undesirable. If the most likely outcome is the patient is going to be in a nursing home, they have an incentive to start talking to the social worker about disposition. Finally, talking about “worst” outcomes is a chance to think about what outcomes would be “worse than death” for their loved one. You do not have to be quantitative in your description of what you think the future is going to be – in fact, the data suggests that patients' and families' understanding is just as good when we use qualitative terms as when we try to give percentages. It is also important to remember that when you give this information it is often heard as disturbing news to the patient or family because by you naming it, you make it more real even if they were not worrying or thinking about it. Strong emotions are likely to follow your predictions, and it will take some time to acknowledge these and ask what questions they have about your thoughts of the future. Someone said that 90% of life is just showing up. This saying might be true of prognostication – you have to show up and give your most informed views (you do not have to be right). Beginning to offer your best judgments about the future will go a long way in helping patients and families understand what they are facing and hopefully do a better job of preparing for and making decisions about the future. You can find more communication education from Bob Arnold at Vital Talk. Does hospice improve survival? What is the evidence? 1. I have heard three pretty prominent speakers – two at large meetings with big audiences – state that the evidence says that hospice improves survival, and have also seen this stated in key papers and reports. They put this on a par with the Temel RCT (and even Jennifer Temel emphasizes that in her study – survival was a post hoc outcome and shouldn’t be overemphasized) and usually cite the 2007 Connor SR et al study in JPSM.1 (Note: that study is already cited by 40 other papers). 2. One of our Maryland snowbirds recently told me about a perceived poor palliative care experience she had while out of state. There were several issues, but one was that she was told – or at least this is what she heard – that seeing palliative care and not getting chemotherapy would help her live longer, and she was not happy with the way this was communicated. I’ve heard the same thing for palliative care providers talking to patients about hospice care. I have concerns that perhaps people are citing this study (and using it with patients) without having read and evaluated it, and many may not be familiar with the study design, data source and limitations. This post provides a short critique in journal club form of the Connor study and some relevant literature, including some results from a recent study we published with better-quality data that found the opposite result as a secondary finding. Connor et al. found an absolute difference of 8 days longer survival in the hospice compared to the nonhospice group, which was statistically significant (but I think most would say, not clinically significant). Although the regression analysis lengthened this to 29 days, this is a challenging finding and it is always concerning when the regression radically changes the results… especially given all the limitations of this study. Since the average length of stay in hospice is approximately 21 days, and 2 of the cancers (lung and pancreatic) have much shorter lengths of stay, a 29-day improvement in survival with hospice care seems hard to believe. In subgroup analyses, they did find significant differences for 3 of six cancers – CHF, lung, and pancreatic cancer – but not 3 others. This study was conducted by actuaries – not by PhD health services researchers or statisticians. There were nurses but no physicians or oncologists involved. A hospice industry group – the National Hospice and Palliative Care Organization (NHPCO). What was the data source? It is important to note that this is Medicare claims or billing data - which has many, many limitations – for example, you cannot tell small cell from non-small lung cancer, or whether the patient has metastatic disease, and the heart failure codes are notoriously unreliable. There are many issues with this study, as the authors state… For example, they used claims to identify different time points at which patients could “shortly thereafter be advised to consider obtaining hospice care.” For breast cancer, this was switching chemotherapies within one-two quarters of the initial chemotherapy. For colon cancer, this was the initial chemotherapy treatment date if there was no resection. Clearly there are many limitations to these indications and this method, which I don’t think I’ve ever seen used elsewhere. This gives about a year’s worth of data – eg, 337 days in the overall sample – so they’re comparing survival for a period of a year, whereas hospice is usually only for a few days or weeks. It’s also important to note that the data used in this study is 15 years old – and much has changed in the treatment of pancreatic and lung cancer, for example, when there used to be few options. For those of you who are researchers, there are also a lot of other findings that are strange… again, their regression lengthened the survival difference by four-fold from 8 to 29 days. Whenever I see a finding like this from one of our students that doesn’t make sense, it almost always indicates that there are problems with the way the statistics were run or the regression analysis. The survival increase for CHF was almost 80 days with hospice, which seems particularly improbable. Also, very few CHF patients had any hospice care, and this study does little to try to account for the many differences between patients who would and would not be enrolled in hospice. There is at least one other study that has similar findings to Connor et al, but used many of the same flawed methods. I believe that providers should not be telling patients that they should enroll in hospice because it improves survival, and speakers should not be promoting this study’s findings alongside the Temel RCT, at least without reading the study carefully and making their own assessment. The Connor et al. study is very poor-quality evidence and I would state that such retrospective claims studies to look at utilization or costs may be appropriate in small pilot studies, but evaluation of survival should be reserved for high-quality, randomized controlled trials with actual patient data, which are unlikely to happen for hospice care. 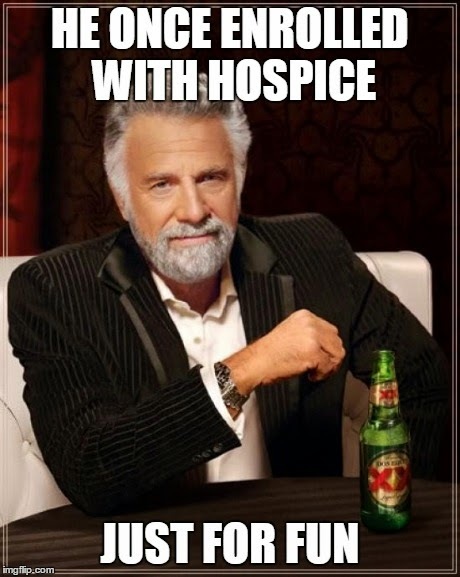 Regardless, the goal of hospice care is comfort and quality of life, and not to improve or decrease survival. I believe that this should be the goal we strive for and what we should tell patients when informing them about their hospice option. Sydney Dy, MD, MSc is a palliative care physician and researcher in the Departments of Health Policy & Management, Oncology and Medicine, and Duffey Pain and Palliative Care Program, Johns Hopkins. 2. Bach PB, Schrag D, Begg CB. Resurrecting treatment histories of dead patients: A study design that should be laid to rest. JAMA. 2004;292(22):2765-2770. 4. Mack JW, Walling A, Dy S, et al. Patient beliefs that chemotherapy may be curative and care received at the end of life among patients with metastatic lung and colorectal cancer. Cancer. 2015. 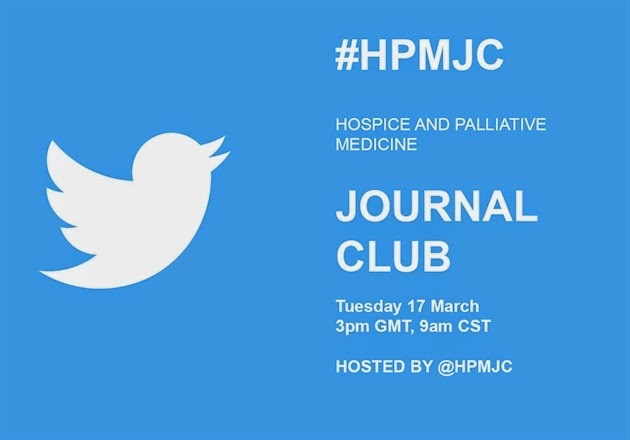 On Tuesday 17th March from 3-4pm UK time (9-10am Central Standard Time) we will be holding the monthly Twitter Journal Club for hospice and palliative medicine: #hpmjc. The aim of the journal club is to provide an informal multidisciplinary forum for discussion of research findings, and we hope you will join us. You can find some more information about the #hpmjc journal club here. The paper for discussion this month is ‘High-flow oxygen and bilevel positive airway pressure for persistent dyspnea in patients with advanced cancer: a phase II randomized trial’. The paper was published in October 2013 in The Journal of Pain and Symptom Management, and is open access . Lead author of the paper, Dr David Hui (@DrDavidHui) will lead this month’s journal club, and will be available to answer your questions on his study. Dr Hui is an assistant professor at the Department of Palliative Care & Rehabilitation Medicine and the Department of General Oncology, The University of Texas MD Anderson Cancer Center. His research interests include symptom management clinical trials, research methodology, prognostication, and integration of supportive/palliative care into oncology. Breathlessness is one of the most distressing symptoms in cancer patients. Many patients continue to experience refractory breathlessness despite treatment with opioids, steroids and low flow supplemental oxygen. Novel strategies are needed to address this symptom. This paper reports a randomised crossover trial of high flow oxygen and non-invasive ventilation. High flow oxygen is a novel gas delivery device that can deliver up to 40 L/min of humidified oxygen via nasal cannula. Bilevel positive airway pressure (BiPAP) provides not only oxygenation but also ventilation and thus respiratory muscle support. Among the 30 patients randomized, 13 completed 2 hours of HFO and 10 patients completed 2 hours of BiPAP. The total completion rate was 77%. In a before and after comparison, patients reported improvement in their breathlessness with high flow oxygen (mean change in numeric rating scale 1.9; P=0.02; mean change in modified Borg scale 2.1, P=0.007) and with BiPAP (mean change in numeric rating scale 3.2; P=0.004; mean change in modified Borg scale 1.5, P=0.13). Some physiologic parameters improved. No significant adverse effects were observed. • Do you have experience using high flow oxygen? • What do you think about the study findings? • What are the mechanisms in terms of how high flow oxygen and BiPAP relieve breathlessness? • Is it ethical to provide non-invasive ventilation in the palliative care setting? • What are some advantages and disadvantages of crossover designs? • What are the implications of this research for your practice? Archive of past #hpmjc can be found here. Katherine Sleeman is a clinician and academic in palliative medicine, Cicely Saunders Institute, King’s College London. Timshel: How do people make tough decisions? The truth is, I have been holding onto this song, Timshel, for years, knowing it would one day fit perfectly into a palliative care related essay. It is my professional anthem in many ways, and when, in the late summer heat in a dusty field in Oklahoma I saw the song performed live, I had chills and a few tears. Hearing it conjures the sum of emotions of those times we have seen families make impossibly difficult and heart breaking decisions, and the helplessness of being there with them, yet nowhere near them all at once. In their article "Talking with Parents About End of Life Decisions for Their Children" In February's Pediatrics, Mirjam A. de Vos and colleagues embarked on a study to see if they could identify the ways that PICU physicians communicate and participate in decision making with parents, specifically regarding life sustaining treatment. With significant data indicating that parents prefer to have a “shared decision making” model, (defined as “a decision making process in which the physicians and the patient or his or her representatives exchange information, deliberate together, and decide together which treatment should be implemented or should not be implemented anymore”) de Vos and her colleagues set out to record actual end of life decision conversations and then assess the level of shared decision making both qualitatively and quantitatively to see how well intensivists in the Netherlands performed this task. Over the course of two years, the research team audio-recorded 47 conversations between physicians and parents of children in which a decision related to withholding or withdrawing life sustaining treatments was discussed. Conversations were then assessed for: speaking time (physician, parents, nurse), communication behaviors through the decision-making process including providing and receiving information, deliberating, and reaching a decision, and finally the extent of shared decision making. As a physician, my hope in reading this was to know “what did the docs do well, what did they do the right way?” and then to be able to reflect on my own skills and behaviors in the family meeting/goals of care conversation and consider ways I can improve. Turns out, docs did one thing really well: talked. They talked about the facts. They shared their perspective and their opinions. They explained which decision they would prefer. It was the physicians who spent most of the time talking, with an average of 67% of the conversation time being carried by the physicians. Some of that time was also spent acknowledging the parents’ emotions and inviting them to ask additional questions. How does this play into the model and practice of shared decision making? Clearly if parents are going to be involved in making a decision, they need information on which to base that decision. No problems there, it seems. What else is key to shared decision making, though? The first step is finding out from the parents how do they prefer to make decisions? Reading this is one of those “smack my head” moments. Of course! Not everyone wants to have the same share in the shared decision making, and the only way to know is to ask them. This was done by 0% of the physicians. Unlike being taught how to listen to heart tones or how to read an EKG, though, the skill of assessing preferences for participation in decisions is not one that clinicians are taught (Billings 2011). In my own attempts to find resources for how to properly assess for patient preferences for shared decision making, I found that much of the writings related to the “how to” peaked in the mid to late 1990s. (If you want to take your own academic detour, as I did on this topic while writing this essay, check out Elwynn’s article from 2000 and its list of sources). There is a growing body of evidence related to what parents want from their children's doctors in terms of end of life decision making. An Australian study found that “parents do not want doctors to be the ultimate decision maker for their child; parents want doctors to support them to be the end-of-life decision maker for their child; and in their decision making and afterwards, parents find information, recommendations, referral and follow up by their doctor helpful.” (Sullivan et al) Studies like this help us know generalities of what parents usually want, but cannot be guaranteed to apply to every parent in every situation every time. It is still imperative to learn ways to assess how they want to participate in decision making related to end of life care. Physicians asked parents about values or preferences regarding continuation or discontinuation in 21% of the encounters, but in 84% of the encounters the parents provided information about these values and preferences. Despite only 11% of the encounters having a physician invitation to share emotions, parents to share emotions , 100% of parents expressed emotions of grief, fear, despair and frustration, and 79% of the time this was acknowledge by physicians. Without having the transcripts in front of us, we can’t say that these were failures on the physicians part – perhaps the emotions were being expressed before the opportunity arose to ask for those emotions to be shared. It would be obtuse to invite a parent who is expressing emotion to share their emotion, just as parents may have provided information about their values and preferences before the physician had the opportunity to ask. This may be a case of “looks bad on paper,” but in the actual scenario was appropriate. This paper and this particular study are a part of a larger research project this group is conducting. The findings and data they have culled thus far are insightful, and this is among the first studies to actually have recorded those end of life conversations, rather than being done retrospectively and asking parents to provide their recollection, after their child’s death, of how those conversations unfolded and how decisions were reached. Many of those studies have been conducted, and here are studies asking parents to provide their perspective on the decision making at the end of their children’s lives, and then relating those to symptoms of depression, anxiety, and PTSD (Sullivan, Caeymaex, Madrigal among others). What has NOT been published thus far, (to my knowledge and based on my Pubmed review on February 4, 2015), has been a prospective, longitudinal study in which the end of life conversations are recorded, decisions are made, and then in the months or years following, parents are asked to provide their feedback related to those conversations qualitatively and quantitatively, as well as assessing parents for depression, anxiety and PTSD. This type of project would allow a more objective study to be done, in which the cloud of emotion and time can be set aside from the end of life conversation, and also in which we might be able to know how heavy that could hangs. Perhaps parents’ recall of the conversations are spot on. If they are not, then what are the components that stand out or, in memory, are not consistent with what was recorded. Even in the current paper, in which it was decided that most encounters results in “some shared decision making,” we do not know how this played out in terms of parent satisfaction or comfort. Were most of the parents fine with “some shared decision making,” or did most want a more active role? Were the instances in which there was “more shared decision making” better tolerated and better handled by families versus those that were only “some shared?” How will families feel about their role in the decision making process as they move forward? Physicians have concerns about end of life decision making and, nobly, often wish to protect parents from the weight of burden of life and death decision making. There are physicians who take this decision upon themselves and inform parents of the decision and the plan, or make strong recommendations leaving little to no room for parental dissent. Other physicians are themselves incapable of making these decisions or offering the families recommendations or suggestions, feeling that it is a personal family decision and the physicians fear unfairly influencing families in the decision they will have to ultimately live with. Some of us are trying to find a balance somewhere in between, moving back and forth along the spectrum. 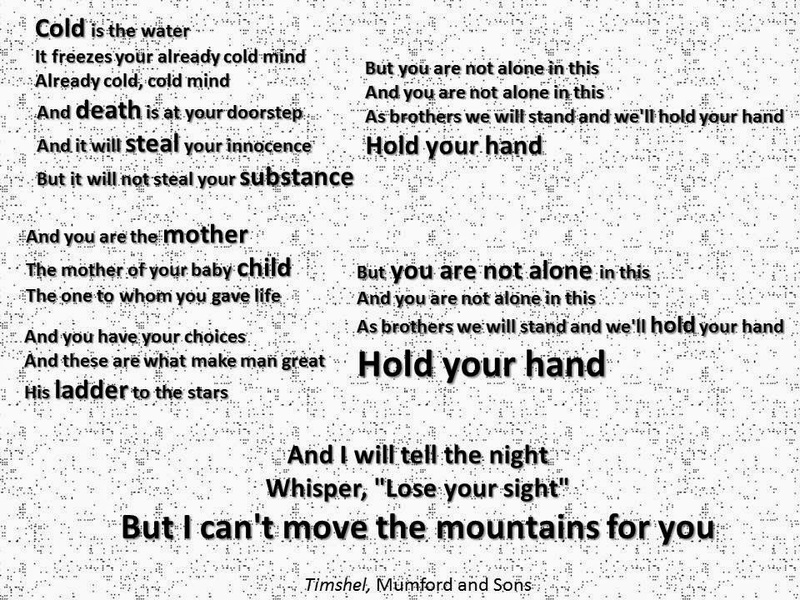 As researchers continue to gather data for us clinicians, it helps us reflect on our skill-sets relating to one of the most important aspects of our work: holding the hands and walking alongside patients and families facing their mountains. “You are not alone in this,” is what parents are asking to hear. 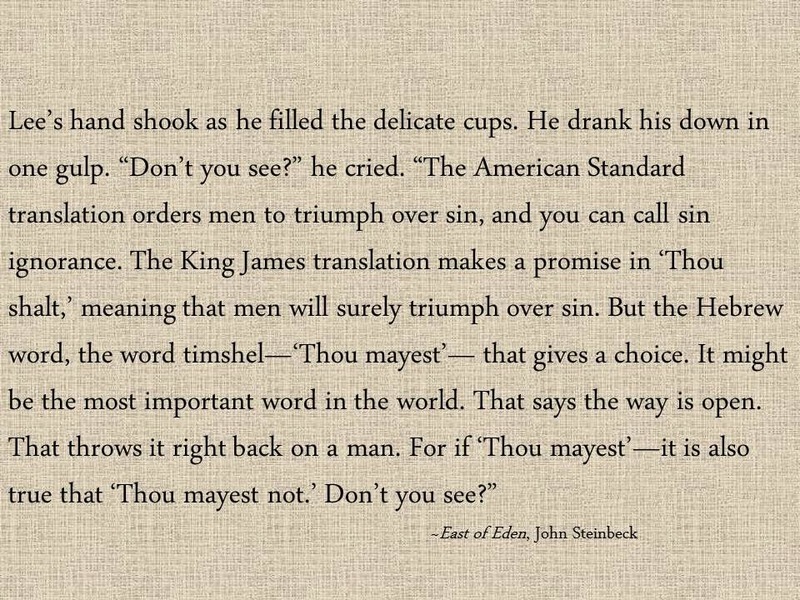 In our role we can help them understand timshel, “thou mayest," and its counterpart, "thou mayest not." At the end of life, when patients and families can feel so powerless and as if everything is entirely out of their control, one of our roles can be to continue to show them the choices that lie before them, the choices they are able to make in order to regain control over this very precious time, the choices they can make to continue to be at their fullest as individuals, as complete families, before a life is over. March 2015 marks two events in the world of American hospice and palliative medicine (HPM) social worker: National Social Worker’s Month and the 60th anniversary of the National Association of Social Workers, our largest member organization. This year’s theme is “social work paves the way for change”. I love this theme because it brings me back to a conversation with a hospice social worker who told me why he loved his job and that I should become a social worker (I laughed at that point in time . . . little did I know). He said that patients and families in hospice are making their way through this dark, twisted path in the forest that is illness. They are lost and confused, and though they want to find a way out, sometimes there is none. He said his job then was not to shine a light on the path and make it easier, nor was it to show them the way out of the forest. Rather, it was to walk with them on their journey and be present. So what paths are we trying to accompany our patients and families on as they navigate? Although our patients and families are each unique, there are some common paths that they may tread upon within palliative and hospice care. Social workers are there to meet the bio-psychosocial-spiritual needs of the patient and family, emphasis on the psychosocial. Yes, what we do overlaps with some of the roles of our other team members (I envision interdisciplinary team roles like a Venn diagram), but a social worker's training is specialized to meet the patients and families where they are and help them determine where they want to go. As part of our Master’s preparation, our ongoing training, and our licensure requirements, we learn about human development, psychological theory, the intricate interactions of the systems in which we operate, and many more specific skills. Topic 1: what are the psychosocial needs of #HPM patients and families/caregivers? Topic 2: what is the most difficult part of psychosocial care of the #HPM patients and family members? Topic 3: how can we measure the effectiveness of our teams at meeting these needs of #HPM patients and family members? Join me @alifrumcally this Wednesday night at 8pm CST to explore the concept of social work and psychosocial needs in HPM. Special thanks to Lizzy Miles, MA, MSW, LSW and the social workers and chaplain from Carolinas Palliative Care and Hospice Network for their input on these thoughts . . . they are invaluable! I regret not writing sooner. Lisa Bonchek Adams, a writer, died last Friday. I regret not telling her how moved I was by her writing, and I admit I have only read a small fraction of her blog. Almost two years ago, she posted "Floating Away" which found its way to me through Twitter. As I read Lisa's writing, the thought occurred to me, "You know, if I had a serious illness, I'd probably want to write more. Writing would bring meaning to me through exploring the experience." 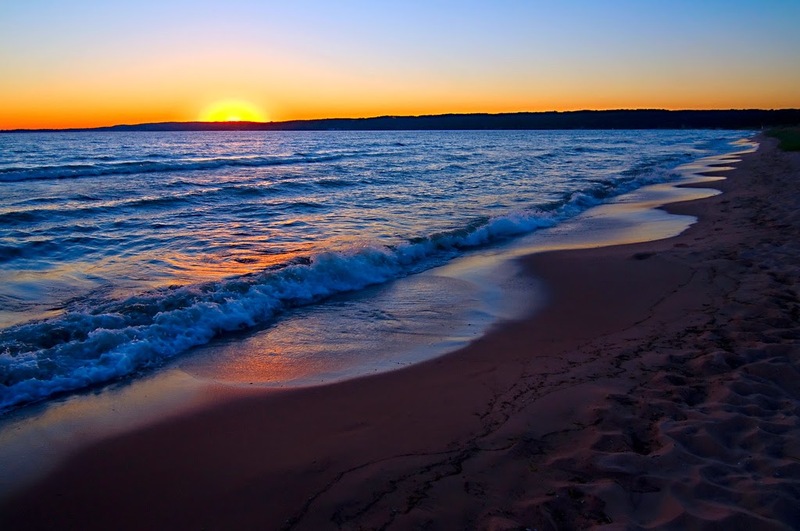 The past several summers, my wife and I have traveled to Northern Michigan with our boys to seek refuge from the humid Midwestern summer. It's a resumption of a family tradition from my youth when I would travel with my parents, brother and sister to visit my dad's family. As I sat on the beach last summer, I thought about "Floating Away." It seemed impossible that I was the same age my mother was when I was eight years old. I remember the joy of running into the crashing yet relatively subtle Lake Michigan waves. At eight, my future on earth seemed as horizonless as the blue water. Every time I would run into the cool water, I would shiver, momentarily forgetting the transient nature of this discomfort as my body adjusted. While I gleefully jumped through the waves, I would think about how life might be in the 21st century. I could never really wrap my mind around it, but I just knew it would be different in fantastic ways that could not be predicted. At 39, my elder son replaced me as the eight-year old. I noted how the scene around me had changed little since the time I was his age. The dunes to the left looked untouched like the font on the signs leading to the beach house. As I looked around at my family, my parents, brother, sister and their families, I was grateful to be together in this way. I thought about my patients and the loss they and their families experienced. The stability of the scene in front of me might have fooled me if not for my age. I can start to convince myself that 1983 was a long time ago. The average birth date of my patients predictably trends closer to mine. Sadness momentarily overwhelmed me. Death is like a wall that forces us to turn around and look back. * What we see is our life and the meaning brought by having lived it. With this hopefully comes gratitude but also the possibility for regret or guilt. Time is precious. 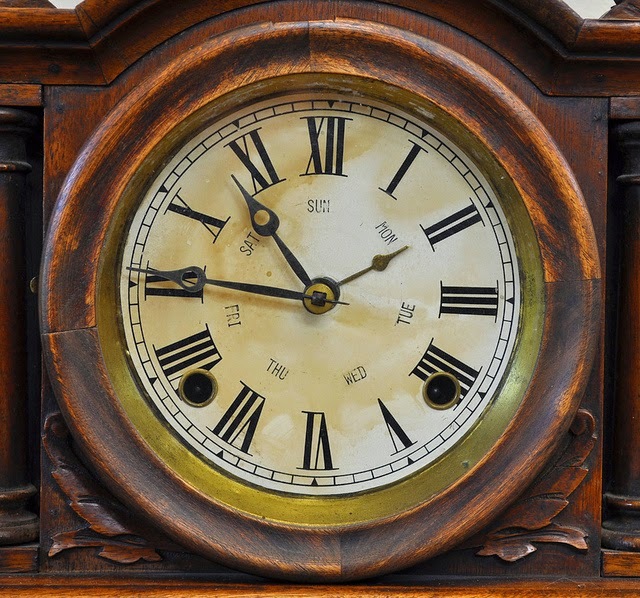 Is there a metric to determine the wisdom of time spent over a life? Uncertainty and imperfection make self-forgiveness important. I faced the lake and pondered the landscape behind me. My mind wandered through hills that led to the farm where my father grew up. The hills connect to roads leading to the other side of the lake and the urban beaches my mother frequented when she was young. The roads branch like capillaries to feed a sprawling, disorganized series of places which make up the vital organs of my life. When the clouds allow, I imagine the sun radiantly warms all simultaneously. A cloud moved just enough to bring warmth. The water glistened and it's a moment of beauty which felt familiar, a moment in time I have lived before. I felt home. I yearn for more moments like this and am quite hopeful for them. That Lisa Bonchek Adams cannot actively create or experience more beautiful moments is a cause for grief for her her family and friends, both near and far. To the world, she leaves behind a trail of writing which opens a door to find more than a bit of beauty. Having followed @adamslisa on Twitter, I know that recent times have been anything but easy. Writing could not have alleviated all of her suffering, but hopefully she found meaning and beauty from it. Moments of beauty require recognition by the observer, and Lisa's quote above serves as a reminder. The observer can create favorable circumstances for beauty to arise by how she lives her life. The wall forces the observer to turn around and look, but then she looks forward to the terrain in front of her to decide which paths to take. The ultimate arrival of the wall is elusively out of her control. If I am to be alive, I should write about the experience. That would bring meaning to me. Lyle Fettig (@lfettig) is a palliative care doctor in Indianapolis where he lives with his wife and two boys. *He thanks Dr. William Breitbart, psychiatrist and Chair of the Department of Psychiatry and Behavioral Sciences at Memorial Sloan Kettering Cancer Center (where coincidentally, Lisa received much of her care). Dr. Breitbart presented a Keynote entitled “Meaning-Centered Psychotherapy: Meaning and Spirituality in End of Life Care” at the 2015 IUPUI RESPECT Conference. He introduced the existentialist metaphor of "death as a wall" during his comments. The recent RCT on Meaning-Centered Group Psychotherapy by Breitbart and others is worth a read and deserves a blog post on it's own. In caring for elders with chronic illness, I often encounter family history notes from hospital that simply say “noncontributory” or “father died of MI, mother died of stroke” or something equally unhelpful. Admittedly, family history as a predictor of risks for developing particular diseases or complications is not too useful or interesting when someone has already reached advanced age with a well documented list of comorbidites that already predict the patient’s likely cause(s) of death. 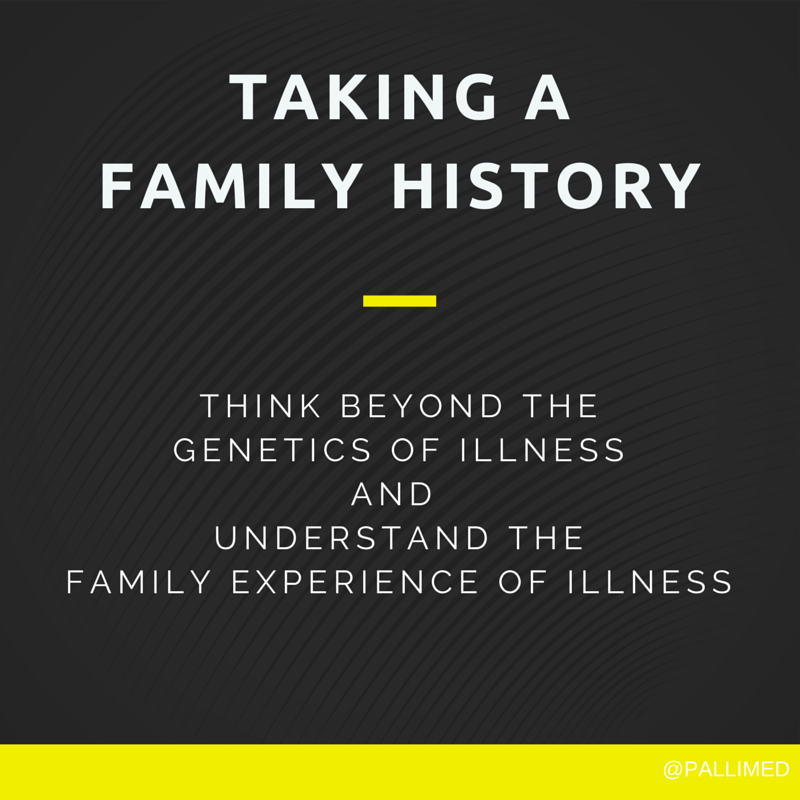 However there is a useful way to reframe the family history when talking to a patient/family already dealing with multiple chronic comorbidities or terminal illness. Ask who among family members and close friends has died, and what was that experience like for them: what was their involvement near the end with the one who died; what do they recall about what went well; or what were problems, etc.? This is often a key segue to fears, unresolved bereavement, erroneous beliefs, thoughts about inadequate care or limiting medical interventions, or opportunity to discover an absence of experience - a hole in their education about end of life. A recent study by Amjad et al* showed that older individuals who have experience with end-of-life care of others show greater readiness to engage in ACP discussions, such as discussing quality vs quantity of life. In contrast, personal experience with major illness did not correlate with such readiness. I am probably not unusual in finding myself surprised when patients with major health problems with limited prognosis are not forthcoming with thoughts about their own end-of-life care. But here is a way to open the discussion to find out ‘where they are at’ by talking about the experiences they have witnessed. It is another way of implementing the Yahoo Maps approach to EOL care. Meet patients where they are: you can't know how to get where you're going if you don't know where you are starting from! Elizabeth Menkin is a Geriatrician and retired Hospice Medical Director formerly at TPMG Inc. and then at SDH-IPM (z’’l). She is now content to deal with ‘one starfish at a time’ in Saratoga, CA. She gains no income from the Go Wish cards, but avidly promotes their use. Have you ever read a journal article and as soon as you finished the abstract you had this forbidding feeling that if the authors actually proved what they claimed to have discovered your medical life will never be the same? This happened to me when I read, “Functional Status of Elderly Adults before and after Initiation of Dialysis (OPEN ACCESS)” by Tamura et al. in 2009. While this study did not track patients who deferred dialysis it is hard to imagine they could do much worse. The view of dialysis as a way to improve functional status by clearing uremia leading to improved nutrition and other downstream benefits was revealed to be a false hope. Instead we have a treatment that appears to be too rough for frail, at-risk patients and left them significantly worse than they were before dialysis. As nephrologists we need to elevate conservative, non-dialytic, therapy to be a clear option for patients, one that should be discussed along with peritoneal dialysis and transplant. Conservative care should not merely be a last resort when all other options have been exhausted. 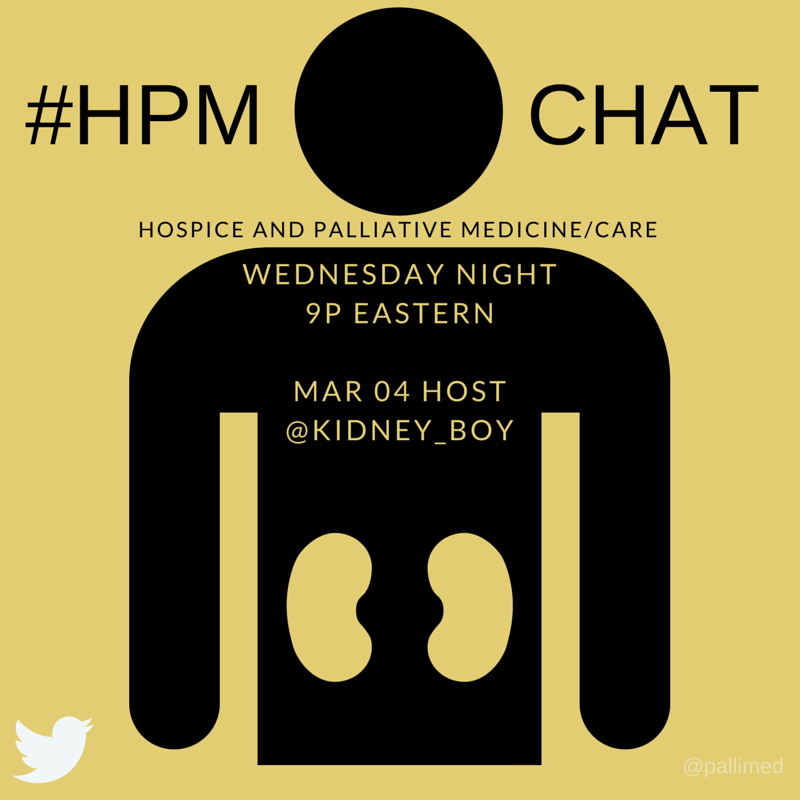 I hope you will join us as we discuss the intersection of nephrology and palliative care this Wednesday at #hpm chat. Let me tell you about a palliative care colleague. His office is next to mine. If both of our doors are open, I can hear his phone conversations. Occasionally, I'll recognize when he's having a challenging conversation. My ears especially perk up when the challenging conversation is with a physician colleague. I cannot detect it by the volume, pitch, or tone of his voice. He varies all of those features as he would in normal conversation even though the topic is more tense. He uses more open ended questions than usual, aiming to clarify the other doctor's position and concerns. He uses more silence. I can hear him patiently listening and never interrupting. I hear statements of appreciation for the role the other physician is playing in the patient's care and/or the relationship the physician has with the patient. When there are areas of disagreement, he makes clear statements of the intention which underlies his position. The intentions are almost uniformly statements that represent interests of the patient. When he makes suggestions, he doesn't represent them as a matter of doctrine. I learn from listening to him. He turns the conversation into a "learning conversation." Does this approach always resolve the issue to his satisfaction? No. But it frequently does. And in the process, he's building relationships with colleagues who might otherwise be skeptical. If we talk about these challenging conversations, he always seems to give the other person the benefit of the doubt regarding their intentions. He doesn't just take this approach with challenging colleagues though. Whether it's our interdisciplinary team, our fellows, or a junior medical student, he consistently brings these ingredients. The first adjective which comes to mind when I think of Atul Gawande is eloquent. The masterfully written Being Mortal would not have been possible without his eloquence. After reading the book, watching the Frontline episode, and now hearing him at the AAHPM Annual Assembly, humble and curious also rise to the forefront. Gawande recognized he could improve his own skill in approaching conversations with seriously ill patients. He sought out those who have expertise, namely his palliative care colleagues at Dana-Farber/Brigham and Women's Cancer Center. And he exercised his curiosity to learn. "Do you ever get ANGRY at physicians who torture their dying patients? Sure they weren't "trained" in communication, but they are human." Those physicians who do this poorly ARE only human, after all. Most (or should I say all?) grew up in a culture where death is the enemy, it's hard to talk about, and then went to medical schools where they were exposed to a hidden curriculum which reduced their capacity for empathy. We may feel angry when things go poorly and we can't fix it, but it's also important to make sure we're pointing our finger at the right problems. The "torturing physician" likely has inadequate skill or capacity to approach the situation fruitfully, and may lack the systematic infrastructure to make up for the inadequacy. We only see the end result of a culture and healthcare system not designed for proficiency in this area. The physician isn't a bad person- more likely quite the opposite. Commandment #8 of the Ten Commandments for Effective Consultation is "Teach with Tact." When describing this commandment, the oft-cited original article mostly focuses on how to leave recommendations. The authors give solid advice about providing references of evidence to the primary physician in a timely manner. "The patient may quote the article to the primary physician....few physicians enjoy expanding their horizons in this matter." Part of our humanity is the desire to always fulfill our physician role as expert, even when we aren't always the expert. We can hope that other physicians will naturally follow Gawande's lead and use their capacity for humility and curiosity to learn from our field. Make a list of those surgeons, oncologists, critical care specialists, hospitalists and others who exhibit these capacities. You may be surprised how long the list already is. What about those that don't exude humility and curiosity? What about those times when we feel angry? "The learning point is how to listen respectfully, assume they know something about the patient, and be humble in my suggestions,” Arnold says. “We need to be as kind to our primary clients, the referring physicians, when they don’t do what we think they should, as we are toward patients and families who make different choices than we would. If I can ask myself why a smart, hard-working doctor would want to do things differently than I would, I can be a better advocate for the patient and help the doctor provide better care for that patient." We need to carefully consider how to teach with tact. We need to skillfully teach with humility and curiosity, gently guiding rather than brashly imparting. Remember what Chester Elton said during his Thursday plenary session as he quoted his father, "You be nice to everybody, because everybody is having a tough day." Empathy isn't just for our patients. Horizons won't expand through lambast and lecture. My palliative care colleague probably sounds familiar to you. You hopefully have colleagues who exhibit the same humility, curiosity, and equanimity. And not just them. You too. Look for opportunities to combine your expertise in palliative care, your desire to help others do better and humility that you can always learn new ways to teach others tactfully. My colleague recognizes this and has signed up for a VitalTalk Faculty Development course this spring. I've done this in the past and highly recommend it. The facilitation methods are grounded in humility and curiosity. Also, keep your eyes out for the work being done by Gawande, Susan Block, and others at Ariadne labs. It's exciting stuff. I recently taught a communication course with a group of cardiology fellows using VitalTalk facilitation methods. One of the very skilled fellows in my group came up to me a the end of the course yearning for even more feedback than what she received throughout the two day course. Atul Gawande's eloquence may not be matched by many but he is not the only one who is humble and curious. This brings me hope. HT to Patrick Clary for helping me get this quote right via his Tweet. Photo: The 2014 PHS Philadelphia Flower show courtesy of www.visitphilly.com. Lyle Fettig (@lfettig) is a palliative care doctor in Indianapolis where he lives with his wife and two boys, both who love Funky Bones at the IMA 100 Acre Park. He proudly declares that he is a member of the VitalTalk Community which he considers an alignment of interests rather than a conflict.